First wash rice and cook it with little salt in the proportion 1:2/2.5(depends on rice quality). Once cooked, spread the cooked rice on a wide plate. Meanwhile,remove hard stems of methi leaves,Wash and chop them coarsely. Once the oil is hot enough add mustard seeds,allow the mustard seeds to splutter. Add urad dal,curry leaves,hing,red chillis.Fry till the dal turns golden brown. Add chopped onions(Optional) and cook till they turn soft. Then add sweet corn,chopped methi leaves ,mix and cook till methi leaves are soft approximately takes 2-3 minutes. Add turmeric powder,salt, jaggery, tamarind juice and vangibath powder.Mix well. Add 1/4 cup of water, cook it on low flame until the oil separates from the masala.This masala should not be too dry or liquid. Now add the rice and mix it well, cover it with a lid and cook it on low flame for a 3 to 4 minutes and then turn off the heat. 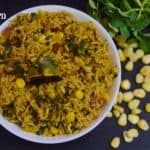 Methi corn rice or Methi corn bath is ready.